There is nothing like going off the grid and getting back to nature. This bundle includes everything 3 people need for camping in the great outdoors. 5-Person Tent - This Coleman 5-Person Instant Dome Tent couldn’t be any easier to setup! All you have to do is unfold the attached poles, extend, secure, and you are good to go in about 60 seconds. The interior measures 10x7 feet and is 5’4” tall in the center. Sleeping Pads (3) - This extra long sleeping pad self inflates so you can get a comfortable night’s sleep on any terrain. Open the rapid-inflation valves and watch the pad fill itself up in minutes. It provides a nice insulating layer from the cold, hard uneven ground to keep you comfortable and warm. Measures 76" x 25" x 2.5" when unrolled. Sleeping Bags (3) - This lightweight sleeping bag is rated for 40-60 degrees and can accommodate anyone up to 6'6". Comes with a stuff sack so it is quite compact. 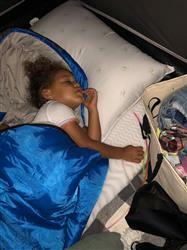 We launder the sleeping bags after every use. Camp Stove - This Camp Chef Everest High-Output 2-Burner Stove is ridiculously easy to use and has everything you need to cook a feast on your camping trip. Small Propane Tank - 16.4oz - One tank should last for about 2 hours of continuous cooking. Headlamps (3) - The perfect accessory for any camping or hiking trip. The brightness is easily adjustable with a touch of the button. Comes with 3 fully charged AAA batteries already installed. Folding Chairs (3) - This chair is comfortable, foldable for transport, and even has a little holder for your drink, which makes it perfect for camping! Measures 38" W x 20" D x 38" H and weighs 12.5lbs with a weight capacity of hundreds of pounds so even the biggest campers can rest comfortably. Lantern (2)- This bright, durable and collapsible lantern is perfect for any type of camping. It easily fits in a backpack. Comes with 3 fully charged AA batteries. Yeti Tundra 45 Cooler - This “King of Coolers” is perfect for a Bears tailgate, a weekend camping trip, or a day in the park with great friends in the 90+ Chicago summer. It fits 28 cans of beer (or pop) with a 2:1 ice to can ratio. A thick layer of pressure-injected commercial-grade polyurethane foam makes sure your ice stays ice for days on end. It measures 26”x 16’x15” and fits in the backseat and most trunks. Enamelware Dining Set (3) - Sturdy and durable plate, bowl, mug, fork, spoon, and knife. Dishwasher safe. Cast Iron Skillet - Pre-seasoned and ready-to-use 10.25" skillet retains heat so you can sear meats or keep meals warm. Marshmallow Roasting Sticks (6 pack) - Our 30 inch long, 6mm diameter, campfire roasting sticks are the Rolls Royce of marshmallow roasting sticks. They will not bend, break or splinter under the weight of a jumbo marshmallow or hotdog. The white birch wooden skewers are sourced from the woods of Maine and the 30" length keeps kids safely away from the fire. When you are done simply toss the sticks into the fire for easy cleanup. Bluetooth Speaker - Jam out with this surprisingly powerful bluetooth speaker. Battery lasts for 15 hours and we include a charger for all weekend power. Built to be water and shock resistant so it is ready for camping. Need help deciding where to camp? Check out our handpicked list of the best spots around Chicago. Check out our list of experiences and decide what you want to do. Pick your dates for our easy and completely free delivery and pickup. No tips accepted! Have a blast by yourself or with friends! We curate the highest quality products and test them extensively for ease of use and durability. We also own all the equipment so we can ensure the highest quality experience. Save thousands of dollars off retail by bevying instead of buying. No more buyer's remorse for things that just sit in your closet. We handle the buying and storing of everything so you don’t have to. Free delivery and pickup in Chicago. Get whatever you want without having to buy it. Easy as that. Rest easy knowing that every bundle you bevy instead of buying leads to fewer landfill items and less wasted storage space. Bevy provides everything you need to have awesome experiences. Our goal is to help you live your best life all while owning less. We curate the best and easiest to use equipment, drop it off at your door when you need it, and pick it up when you're done. How clean will everything be? We are absolutely obsessed with cleanliness here at Bevy. Every product is thoroughly cleaned after use. All dishes and cookware are put through the dishwasher and are guaranteed to be sanitary and hygienic. Blankets and other machine washable items are laundered after every use so they are guaranteed to be clean. Yes. We currently deliver to a good portion of Chicago's neighborhoods. We go as far north as Lakeview, as far west as Humboldt Park, and as far South as the Loop. You can see our service area on this map. $80 for drop off and pickup. No tips are accepted! So no need to do math or fumble for cash. We currently deliver to a good portion of Chicago's neighborhoods. We go as far north as Lakeview, as far west as Humboldt Park, and as far South as the Loop. You can see our service area on this map. What if I’m outside of your delivery service area? We have a few options for you: We can deliver to your work or a friend/relative's house in our delivery zone or you can come pickup everything at our Lincoln Park warehouse. Shoot us a message and we can make a plan. Will you deliver and pick up from different locations? Yes as long as both locations are with in our delivery service area and we have coordinated the locations beforehand. Do I have to be there for delivery and pickup? Yes we require that someone is there for delivery and pickup so we can be sure that you receive everything and so we can answer any questions you may have. If you are comfortable with taking the liability of leaving everything with the doorman, that is ok with us. Can I pick up and drop the stuff off myself? Yes if you would like to do that please send us a message and we can find a time for you come by our Lincoln Park warehouse. How do I change my delivery/pickup time? If you would like to do that please send us a message. We will shoot you a text to coordinate deliveries and pickups. You select your drop off and pick up dates on the details during check out and we will text you to arrange times. How long do I get to keep everything? Most reservations are for the weekend with delivery on Thursday/Friday and a pick up on Monday/Tuesday. If you need an experience for longer, we are happy to work with you to make it happen. Just shoot us a note. Do I need to clean the products before I return them? Bevy only works as a community if people treat all the rentals well. Please treat everything as if you are borrowing it from a good friend. For most products a simple wipe down and disassembly is all that is needed. Returning items damaged beyond normal wear and tear or excessively dirty may result in your losing access to ﻿﻿Bevy or being charged to replace the product. What if I run into issues with a product while using it? We try our best to source the easiest to use products and deliver detailed instructions on how to use. If you do run into trouble please shoot us an email or a text and we will do whatever we can to make sure you have a good experience. What if a product I have gets lost or broken? Some wear and tear is understandable. Significant damage and theft is not. If an item is returned beyond repair or never returned, we will have to charge you the retail price of the good. I was recently brainstorming thoughtful and affordable ways to surprise my wife for our wedding anniversary when I received a promotional email from Bevy. A few clicks later, I had scheduled an “urban glamping” date night for us and our pup using Bevy’s “Camping Essentials” package. I was hesitant about renting my first Bevy experience, believing the price to be pretty low for all that was included. I couldn’t be happier with the level of “concierge service” that is offered with Bevy experiences, from the free drop-off and pickup to the friendly reminders and text messaging to coordinate everything. I’m already looking forward to my next adventure sponsored by Bevy and I highly recommend Camping Essentials to anyone who wants to get out (or just stay in and get cozy). I am really really happy with the experience. We were able to use everything included. The equipment was clean and promptly delivered and in excellent condition. We only had to pack food, bug spray, cooking tools, a pot for tea and some pillows and off we were! The only thing I struggled with was setting up the tent as this was our first ever camping trip. But thanks to the other campers that helped us with it, we were able to set it up shortly after. One suggestion I have is if you could put a video together of the equipment included and how to use it, it would be helpful (especially to first time campers such as myself) and if you could include some cooking tools like spatula and tongs. I think we feel so much more confident planning a camping trip again. 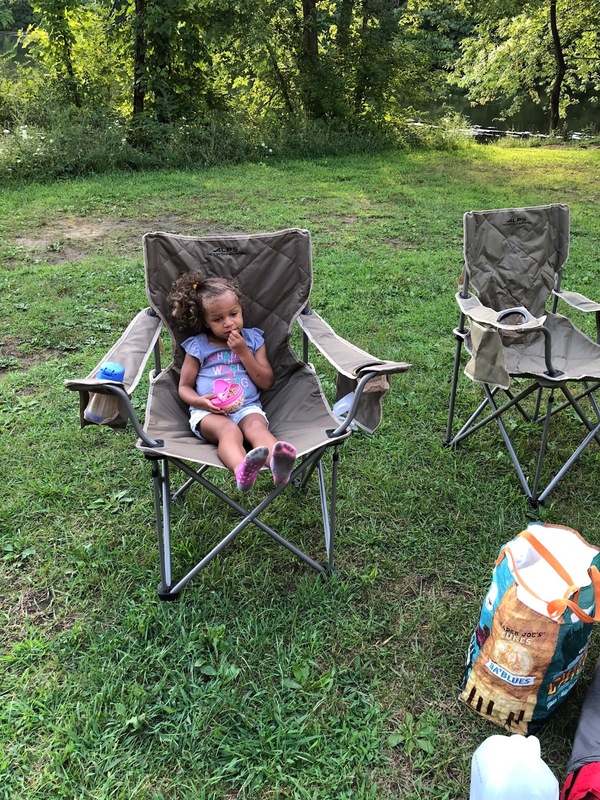 I am so glad to have stumbled across Bevy as it made our first time camping experience so much more easier and less daunting as we had most of everything we needed. Keep up the great work and thank you! I'll be recommending BEVY to everyone I know and help spread the word for sure! I must say that renting The Ultimate Camping Experience saved me a lot of research, actually, it saved me from having to do any research! 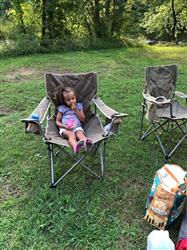 It was my first time camping, along with my husband and three year old daughter. We didn’t know what to expect. I was so delighted to find Bevy. It detailed all of the items included in the package, and we used everything, the headlamps were a great touch! I hadn’t even thought of that. I will say though that it took us 15 more minutes to get the tent up than the instructions said. I chalk that up to it being our first time ever doing it. Once we figured it out, it was super easy to do. So if you’re a first timer, just be patient, you’ll get it. One other thing, I wished there was mention, an asterisk maybe saying *pillows not included. I don’t expect Bevy to rent those, I can see why they wouldn’t buy just a mention of it would have been good so at least it would have been on my radar to purchase. In the end, we bought a couple, which was fine. Overall, we had an amazing time and ‘our’ stuff, Bevy’s really, was the talk of the camping trip! 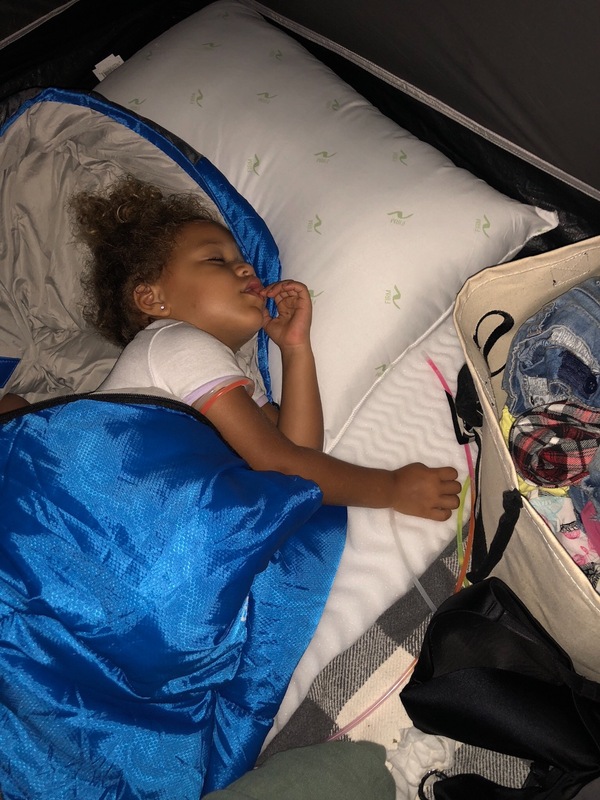 The only thing we packed was food, ice, cintronella candles and bug spray! Bevy, from my family, THANK YOU!! highly recommend for first time campers ! We booked the camping package for Memorial Day Weekend. 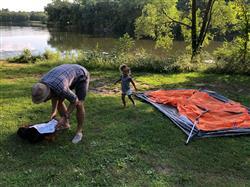 As first time campers, we had no idea what we needed, and booking the package took out the stress of figuring it all out. We used every item provided, which were in excellent condition. The delivery aspect the day before a long weekend was also super convenient. I would highly recommend! The tent provided was easy to assemble and spacious for 4 people. The sleeping mats made sleeping on the ground really comfortable. The stove worked great and cooked our meals quickly. A must try experience in my book. Ready To Have More Fun? Be the first to know about our latest launches, local events, new stories and more! Bevy delivers everything you need for unforgettable experiences and everyday activities. Serving Chicago.